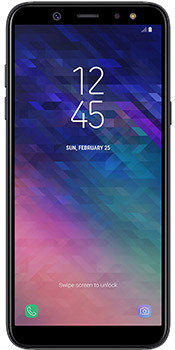 Sleek and stylish design, with an expansive, near bezel-less sAMOLED display, the Samsung Galaxy S6 offers an immersive and uninterrupted experience. Now you can unlock you phone instantly by simply holding it to your face, thanks to Face Recognition on the Galaxy A6 (2018). You can also easily keep important things on hand with expandable microSD storage—up to an additional 256GB. Capture the a bright shot wherever you shoot, with a 16MP camera with a faster, wide aperture F1.9 lens to let in more light when capturing in darker environments. Add some creative flair to your photos, with various camera modes, stickers and creative filters. Shoot a selfie on the 16MP front camera with FHD video recording (1920 x 1080)@30fps. Enjoy Boundless viewing enjoyment, with the A6’s Infinity Display with 18.5:9 ratio that holds your attention. Galaxy A6 is designed with an expansive, near bezel-less 5.6 in ch sAMOLED display that features vivid resolution and stunning contrast ratio. A 1480 x 720 (HD+) resolution keeps things sharp and vivid. Choose from Single Sim or Dual Sim options to best suit your lifestyle. Powered by 4GB RAM, Octa-core 1.6 GHz Cortex-A53 and Android 8.0 (Oreo), you’ll enjoy an immersive and efficient experience. Use the onboard personal Samsung health manager to keep your life in optimal balance. Stay onto of things with Samsung’s Bixby. Built into your favourite apps, so setting reminders based on time and location is easy.